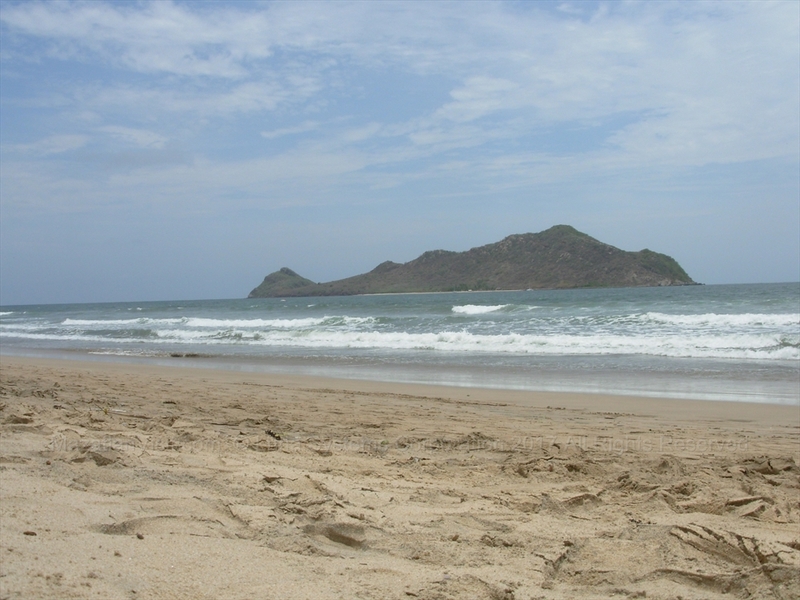 Mazatlán is blessed with over 20 miles of beautiful beaches. The word "playa" means beach in spanish. Here is a list of the main beaches in Mazatlán and information about them that will let you make your decision on whether to go to them or not. You need to look at the flags and warning signs at the beaches before swimming. All of the major hotels on the beach have warning flags and signs near their beach entrances that you should alway look at when planning on swimming. There are times when the waves and currents are bad and/or there are jelly fish. Also, do not drink alcohol and swim drunk. Although less common now, there are still frequent deaths to swimming when being drunk! The beaches in Mazatlán are pretty good. Mazatlán's beaches stack up well against other Mexican beach resorts. For example, Puerto Vallarta has many beaches that are rocky and with a steep depth drop-off close to shore. Many of the beaches as Cabo San Lucas, Puerto Escondido, Acapulco, and Hualtalco can be too dangerous to swim at due to the wave action and currents. Mazatlán's beaches don't have the fine white sand like in Cancun, but rather like all other Pacific Ocean resorts has a courser sand. 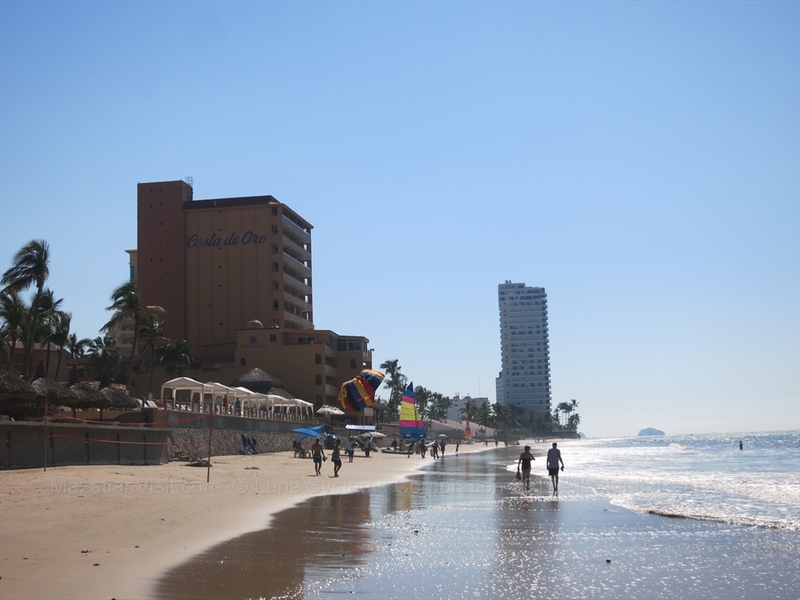 Unfortunately, the sand in Mazatlán does get hot to walk on, unlike Cancun, during the hot period of the year. 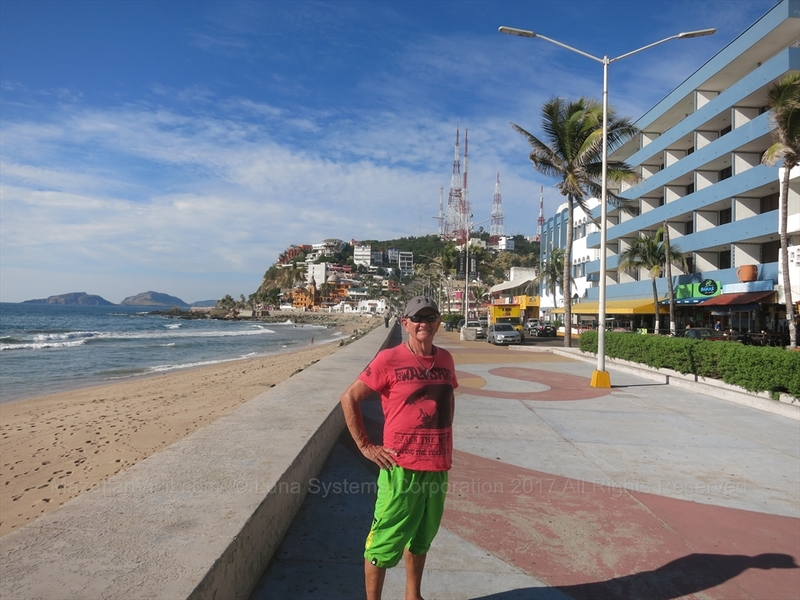 Most of the beaches in Mazatlán are fairly wide, very walkable, and very swimmable. Some years, if there are lots of winter storms, the sand on some beaches can be low, but this doesn't happen every year. Over time, the sand returns. On Sundays, the beaches are typically filled with more families and children because this is typically the one day off many workers in Mexico get. 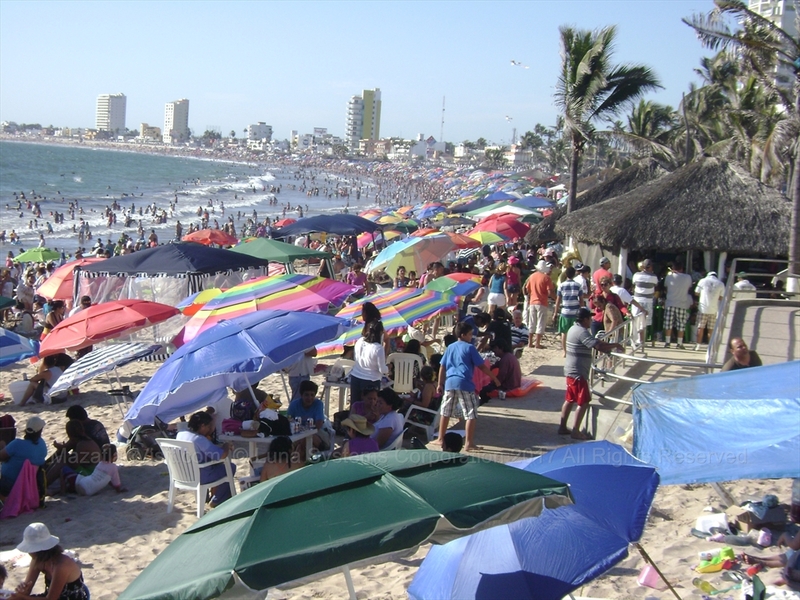 During Easter (Semana Santa), every beach in Mazatlán is packed with mainly Mexican national tourists! The main beaches get so busy that you cannot barely see sand if you are looking down on them above! So, if you are looking for a relaxing beach time, don't come to Mazatlán during Easter! All of the beaches in Mexico are public and free so they cannot be blocked by landowners. Usually, there are no motor vehicles allowed on the beaches, except for life guards, police, and military. However, most hotels will have a roped off section for their patrons so that the beach vendors do not bother them. On many beaches in Mexico, there is a lot of activity. There can be multiple-piece brass bands looking for people to pay to hear them play songs. There can be beach vendors hawking blankets, hats, sun glasses, jewelry, hair-braiding, write your name on a grain of rice, fruits, flan, shrimp, etc.! If you want to not be disturbed, stay in the roped off section of the hotels where the beach vendors will not go. 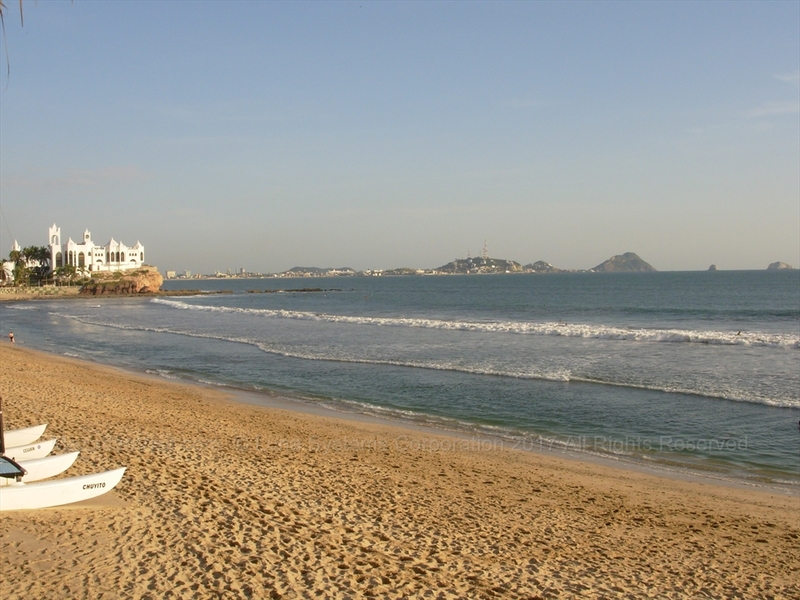 Below is a list of the main beaches in Mazatlán that you may want to go to during your time in Mazatlán. Located in the Golden Zone, this is one of the most popular beach in Mazatlán. It is medium wide and very sandy. It is fairly shallow for a long distance out so it is good for swimming and boogie boarding. However, later in the afternoon on most afternoons the wind picks up and the waves can get large making it more difficult to swim. This beach is not always great for walking on because of the deep sand and the slope especially during high tides. The best place for children to swim is in front of the Hotel Playa Mazatlán. At the southern-most end of the beach around the Fiestaland point the waves are larger and this area is frequented by surfers. 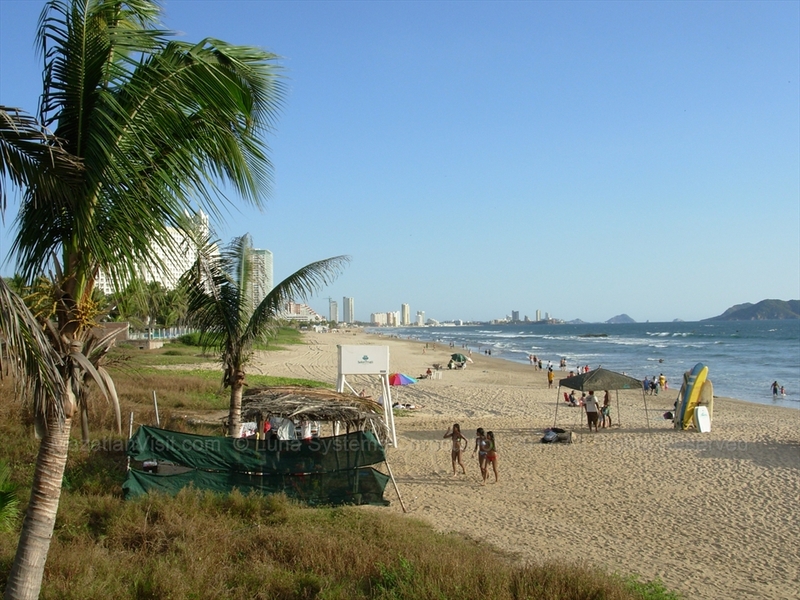 Joe's Oyster Bar, the best beach bar in Mazatlán, is located on this beach. You can enter/leave the bar from the beach. In front of the bar is one of the busiest places on any beach in Mazatlán because you can be on the beach and listen to the music coming from the bar! If you need to rent a jet ski, sailboat, boogie board, or umbrella, be sure to rent from Miguel directly in front of Joe's Oyster Bar! Located in the middle of the Golden Zone, this is also one of the most popular beaches in Mazatlán. There are a number of big hotels and condos on this beach where there can be crowds of people. Other parts of the beach can be almost empty. This is a wide beach and the waves on this beach are usually not too large. This beach is great for walking on because it is wide and fairly flat. There are a few points where the beach disappears at high tide so you may not be able to walk the entire beach at these rare times. This beach is not as good for boogie boarding, but some is done in front of the El Cid hotel. There usually isn't this is a wide beautiful beach. Parts of this beach can get busy in front of the various hotels that line this beach. This is a small beach located on Deer Island, one of the 3 big islands located just off the coast of Mazatlán. You will need to take a boat or the amphibious truck from Playa Gaviotas near the El Cid Hotel to get to Deer Island. There are limited facilities on Deer Island. Most people go on tour for a few hours which includes snorkelling and lunch. There is decent snorkeling around Deer Island. Located at Stone Island (Isla De Piedra) which is actually more of a pennisula than an island. This beach is a beautiful, wide, flat beach that is protected from large waves so it is popular with families with children. There are many restaurants and a few hotels on the beach. Many tours will take tourists to this beach. 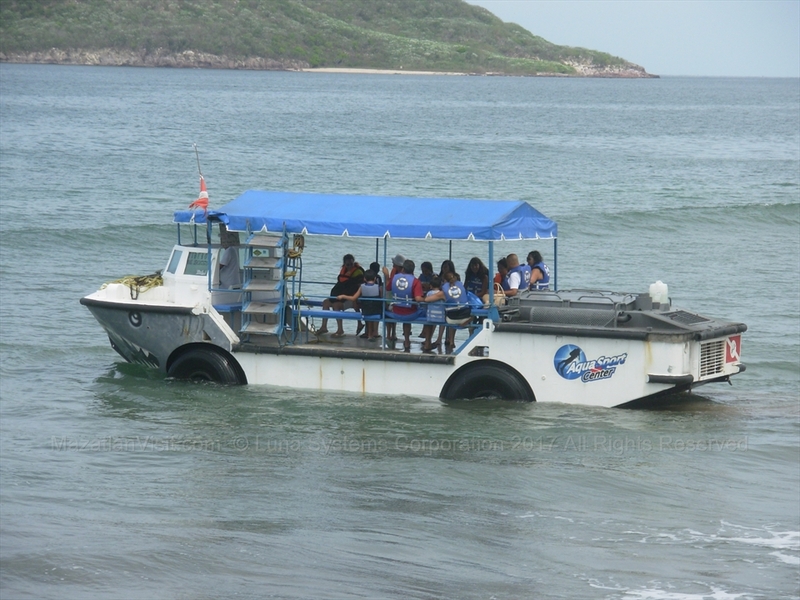 It is also accessible by boat for about MX$30 pesos return(keep your ticket stub) from the Port of Mazatlán at the last stop of the Sabalo Centro bus a block from the road that goes to the El Faro lighthouse. Stone Island is good for a day trip with a group of people. Located in the northern part of the Golden Zone, this is a wide beautiful beach. Parts of this beach can be fairly busy with tourists from the many hotels that line it. Located at the northern end of the tourist area in Mazatlán, this is a beautiful, long, sandy beach. Located at the northern end of the tourist area in Mazatlán, this is a beautiful, long, sandy beach. It is considered one of the best beaches in Mazatlán. For many years, it was a very quite beach, but now is lined with condos and the huge Riu Hotel. It is still not that busy and worth going to if you want a quiet beautiful beach. At the most northern end at Cerritos point is one of the few surfing locations in Mazatlán. Also, at the end of the beach is a fantastic restaurant, Mr. Lionso, which we highly recommend. 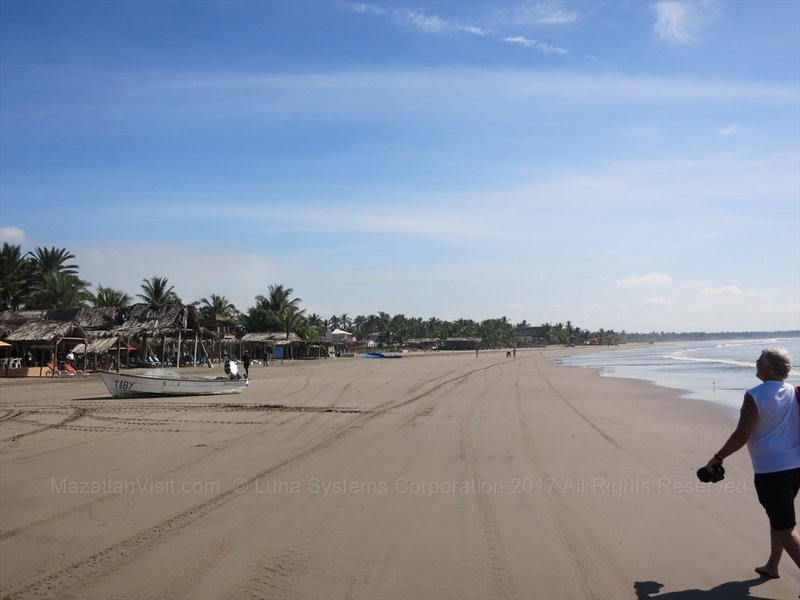 To get to Playa Bruja, you can take the Sabalo Cerritos bus which runs up Avenida Camaron Sabalo, the main street in the tourist area. This bus goes all the way to Cerritos which is about a 15 minute bus ride north of the golden zone. Playa Norte is located at the north end of the malecon before it turns around the corner to Los Pinos. There are many small fishing boats at this beach. Not many Canadian and American tourists go to this beach, but most people will pass by it on their way to Olas Altas or Downtown. Located in Olas Altas, this is a small beach. This beach isn't that busy. People that are staying in Olas Altas or downtown Mazatlán may use this beach. 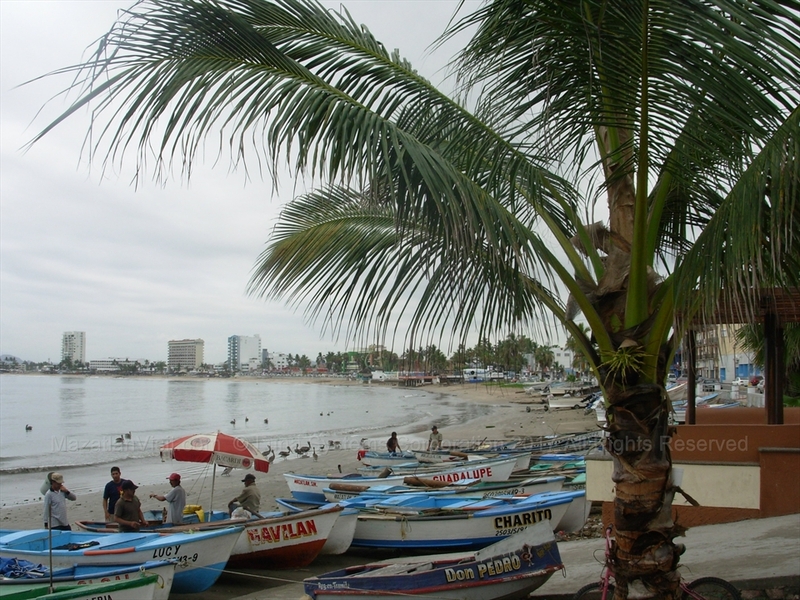 In front of the beach is a continuation of the malecon sea wall and many restaurants, bars, and hotels. Located in the Los Pinos area which is where the Avenida del Mar turns to head toward the old town Mazatlán, this is a very small beach. It has a reputation for being the beach for grandparents and grandchildren because is very shallow and the waves are small. On weekends, it is packed with local families. Not many Canadian and American tourists go to this beach.